The regional divisions of North part of the African super-region. The Northern African regions are part of the Africa super-region. The area is heavily populated although there are more than a handful of uncolonized provinces along its southwestern coast which can be used by the European powers as a stepping stone to get to far lands of the Americas. The area houses the Maghrebi nations in the northwest who cause grief and anguish to the European nations around them due to their ongoing coastal raids. In the northeast can be found the resident super-power, the Mamluks, although they are too busy most of the time with the creeping threat from the north in the form of the Ottomans. There is an ongoing religious war in the southern parts. In time, the Sunni nations will mange to push the borders against the Fetishist and Coptic nations in the southwestern and southeastern parts respectively. The question remains whether they'll be able to put their religious abilities to good use, stop the attackers and perhaps even push them back. The Fetishist religion is able to better adapt to situations the more it explores the world with each new faith providing a different cult with a different bonus. The cooperative Coptic religion starts with two of its bonuses in the bag from the get-go with one holy site already in Coptic hands and another in the process. Monarchy government forms in the northern and eastern parts (mainly Iqta and Autocracy). Tribal government forms in the central and western parts (mostly Tribal Despotism and Tribal Monarchy). The occasional Clerical State can be found sporadically. Sunni is the dominant religion in these parts (with the occasional Ibadi and Shia). Coptic in the eastern part (along with the only two Jewish provinces in the game). Fetishist in the southern parts. Muslim in the northern part (mostly). East African in the eastern part. West African in the central and western parts. Maghrebi and Levantine in the northern part. Cushitic and Sudanese in the eastern part. Mande, Sahelian and West African in the central and western parts. Some of these nations don't exist at the 1444 campaign start. They can appear if another nation chooses to form them. In (parentheses) are the historical dates they first appear in, if available. These nations don't exist and also lack cores at the 1444 campaign start. They can still appear if Separatist rebels manage to take control of their cultural provinces. For Nubian and Beja countries. Notes: This region holds provinces necessary for forming Arabia and Egypt. The provinces of Alexandria (358) and Qasr Ibrim (1234) are of religious importance for Coptic nations; Alexandria is of significance for Orthodox nations as well. For Somali, Afar and Harari countries. Notes: The province of Aksum (1227) is of religious importance for Coptic nations. The provinces of Semien (2771) and Dembiya (2772) are the only Jewish provinces in the game. For countries in the Maghrebi culture group. 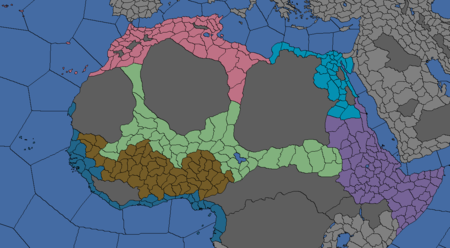 Notes: This region holds provinces necessary to form Algiers and Tripoli. Muslim Moroccan Maghrebi (Moroccan) Fez (343) Overlord of Marrakesh, Sus and Tafilalt. For Katsina, Kano, Zazzau and Hausa. Notes: This region holds provinces necessary for forming Sokoto. This page was last edited on 2 January 2019, at 19:25.